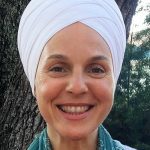 Sat Kaur Khalsa is a certified Kundalini Yoga Lead Trainer and Beyond Addiction Lead Trainer who has studied Kundalini Yoga since 1990. An avid life-long learner in numerous healing and movement practices, she facilitates local and international teacher training programs as well as leading yoga retreats worldwide. Sat Kaur lives in Nelson, British Columbia and is passionately committed to support students in achieving their infinite potential through the gifts of these sacred teachings.